Save the date of the 9th Annual Forum! The 9th EUSBSR Annual Forum will be organised in Tallinn, Estonia, on 4-5 June 2018! The main theme of the 9th Annual Forum will be the Baltic Sea Region After 2020: how to improve the implementation of the EUSBSR in the framework of the future EU Cohesion Policy? Some improvements have taken place at the EUSBSR website! For example, the Policy Areas and Horizontal Actions are now briefly presented and the overall Strategy framework is (hopefully!) clearly introduced - even for those who are not yet familiar with the EUSBSR! The group of National Coordinators (NC group) is the overall coordination body for the development, implementation and policy monitoring of the EUSBSR. The NCs have decided to start publishing their meeting reports and other relevant documents on the EUSBSR website. For example, the Rules of Procedure document establishes the rotation of NC group's chairmanship and the organisers of EUSBSR Annual Fora until 2025! Check the latest post about DIGINNO project of Policy Area Innovation! Check the new project library of the INTERREG Baltic Sea Region Programme! Introductions and stories of the funded projects are now available in the project library. Flagships of the EUSBSR are nicely tagged. Check the programme of over 130 events! For instance, on 11 October, the potential of macro-regional strategies post-2020 is discussed. EUSDR Forum is organised on 18-19 October followed by EUSALP Forum on 23-24 November. Check the EUSBSR events listed on the website! Several events of EUSBSR stakeholders, such as the Baltic Sea Tourism Forum, IWAMA Water Forum and ScanBalt Forum take place during autumn. Check the list of upcoming events - and let us know if you want your event on the list, too! "Let's communicate!" 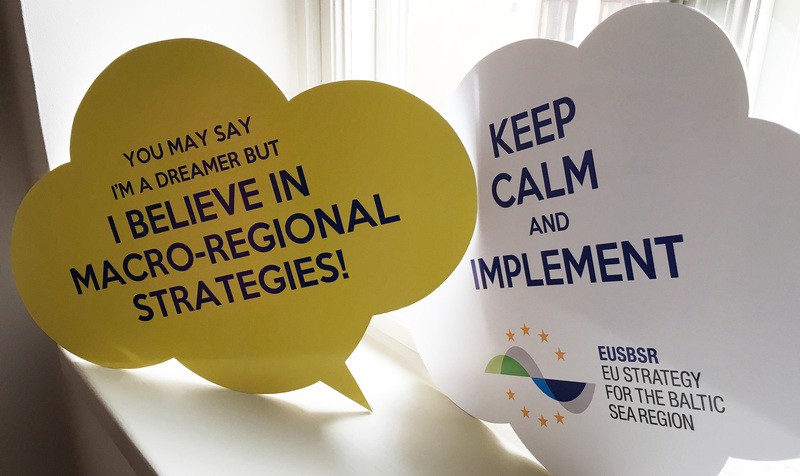 project fuctions as the Communication Point of the EU Strategy for the Baltic Sea Region. The project is funded by the Interreg Baltic Sea Region Programme.